South Korean President Moon Jae-in is expected to focus on his role as a mediator between North Korea and the United States ahead of any potential breakthrough in the Korean Peninsula peace process that may be achieved at the upcoming summit. U.S. President Donald Trump announced in his State of the Union address in Washington on Tuesday (local time) that he will meet North Korean leader Kim Jong-un from Feb. 27-28 in Vietnam for their second summit talks. 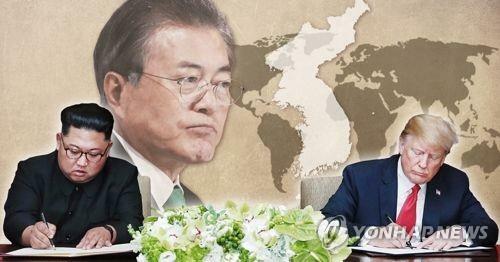 Moon has yet to comment on the forthcoming talks, but as a man who has claimed a role in expediting denuclearization, he is likely to have great expectations for an agreement to be reached on outstanding issues. While the first U.S.-North Korea summit in Singapore last year was somewhat symbolic in that it merely laid the foundation for headway to be made, Moon may believe that the second summit should produce more substantial and concrete results. As many experts think a deal on U.S. measures in exchange for the elimination of North Korea’s nuclear and missile programs could be the key, Moon is likely to make more effort to mediate and facilitate talks between Washington and Pyongyang. Although it may look difficult for the South Korean government to voice its opinion at the upcoming summit, Seoul can still talk to both sides behind the scenes. For instance, National Security Adviser Chung Eui-yong recently met with U.S. Special Representative Stephen Biegun ahead of the latter’s visit to Pyongyang. Following the confirmation of the second U.S.-North Korea summit, there was even speculation that Moon may visit Vietnam to help speed up the denuclearization process. Since Trump is also expected to meet Chinese leader Xi Jinping later this month, some pundits have even suggested there could be four-party talks involving South and North Korea, the U.S. and China in Vietnam and that an “end of war declaration” may take center stage. The two Koreas technically remain at war as the Korean War ended only with an armistice, not a formal peace treaty. However, an official at Cheong Wa Dae rejected the idea of Moon visiting Vietnam, saying there has been no discussion of that plan. “We have to see whether we’re in a situation to have a trilateral summit with North Korea and the U.S.,” the official said on condition of anonymity. 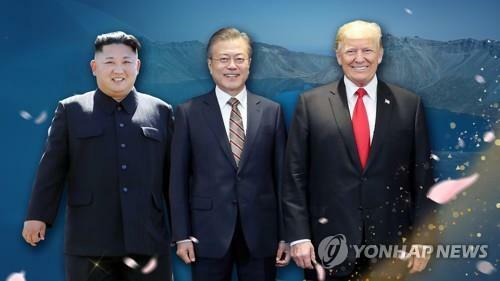 Experts, meanwhile, said Moon will keep close tabs on whether U.S. forces in South Korea and the allies’ joint military drills on the Korean Peninsula will be on the negotiation table at the Trump-Kim summit. Cheong Wa Dae believes once the U.S.-North Korea summit ends with meaningful results, such a development could boost the government’s policy on North Korea and may speed up Kim Jong-un’s visit to Seoul. Moon and Kim agreed in September to hold what would be their fourth summit “at an early date,” but the two sides have yet to make further progress on the issue.